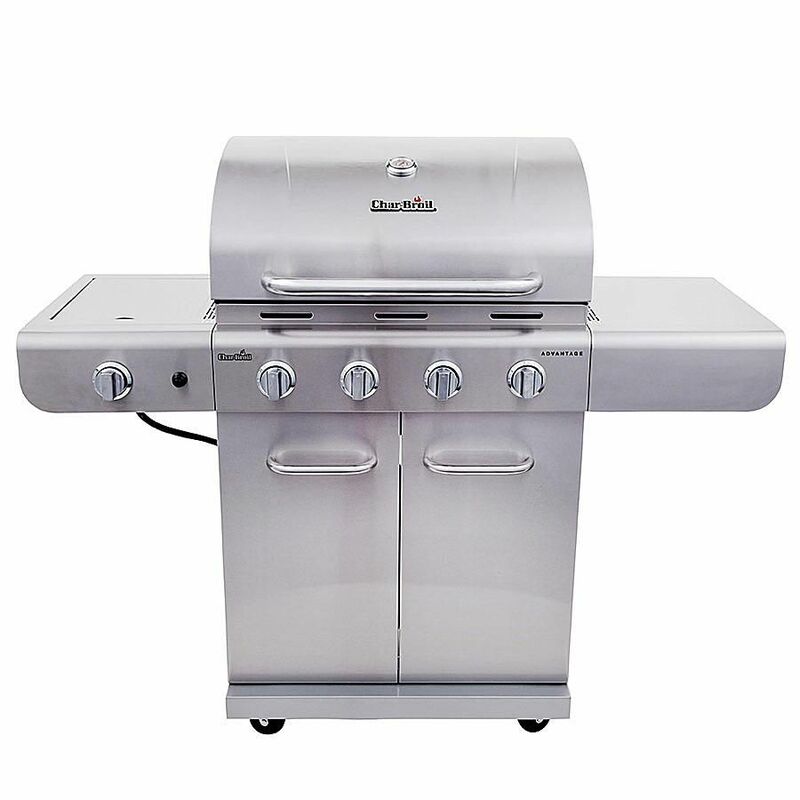 The Char-Broil Advantage Stainless 4-Burner is one of the shiniest gas grills sitting on the showroom floor of stores worldwide, and is built to stand out and look great while it sits indoors. With a large stainless steal construction and a fairly inexpensive price for the size, there are many benefits to this gas grill. However, buyers should be aware of its low-grade materials used in construction along with its thin and lightweight burners. There's also a flimsy cart construction, low heat output, and a low-powered side burner. With the varying pros and cons, it's important to consider how long your grill will stay in shape, and whether or not you'll be satisfied with the low-powered energy grade, translating to 30,000 BTUs under 450 square inches of cooking space. The Char-Broil Advantage Stainless 4-Burner is a standard designed gas grill with four burners and a side burner wrapped in stainless steel. However, this grill is oddly underpowered. It is recommended to reduce the heat output of the gas grill because the components can't take the heat. With this model specifically, the thin and low grade stainless steel can become discolored with excessive heat. However, the hood has an inner lining which may protect it to an extent. This grill also has low power so that it can reduce the cost of the four main burners, which are top ported and less expensive to manufacturer. While this grill is large and shiny, it isn't the best grill in comparison to others on the market. However, the 4-Burner model is one of the most popular product lines due to its low price of around $200. If you can't afford to purchase a higher quality gas grill, and you refuse to go charcoal, then you might consider getting this one. You can always save up for your next grill in a few years. With the Char-Broil, don't expect the grill to be a powerhouse, last very long, or cook evenly. Whether you've decided to go with this gas grill or another, the fun part is when you get grilling. While you could always try some staples like steaks, hot dogs, and ribs, you can also venture out and grill some other foods. Throw on more basics to get them out of the way—hamburgers, fish, chicken, shrimp. Once you've tried your assortment of meat and seafood, you can try to mix it up with some bratwurst, shish-ka-bobs, and vegetables like corn on the cob to impress your family and guests.